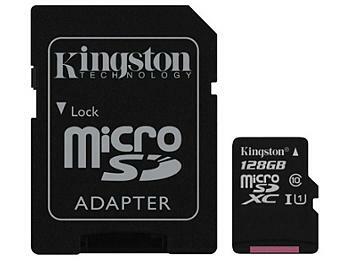 The 128GB UHS-I microSDXC Memory Card from Kingston expands the storage of your smartphone, tablet, and other microSD compatible devices. This Class 10 memory card features a 45 MB/s maximum data read speed and 10 MB/s minimum data write speed making it a suitable card for capturing photos, recording HD quality (1080p) video, and more. In addition to storing your photos and videos. This memory card also gives you more space for apps, games, and other files. Included with the 128GB microSDXC memory card is an SD adapter allowing you to insert your card into devices with a standard SD card slot.